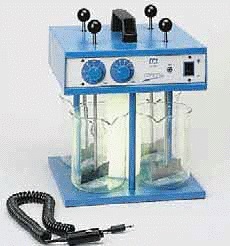 The Laboratory Flocumatic and the Portable Jartest are flocculators used for the determination of the necessary agents required for sedimentation. They are used to optimize the coagulant additives and poly-electrolytes for surface and residual water treatment, as well as evaluate the efficiency of an absorbent in toxic agents. 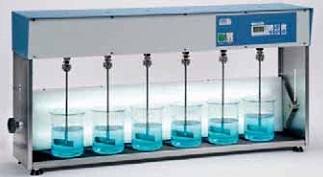 The Laboratory Flocumatic flocculators come in either 4 or 6 positions, and have powerful torque to allow stirring and mixing high viscosity substances. Suitable for beakers up to 1000 mL tall or 2000 mL short shape. The Laboratory Flocumatic allows for the mounting of two horizontal or vertical illumination units. The Portable Jartest flocculator features 4 positions and is convenient for measurements on site Complete with illumination and suitable for vessels up to 1 L in capacity.